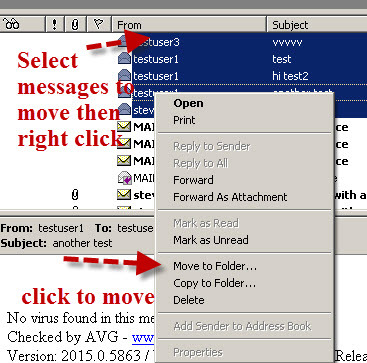 Outlook Express like many other email clients stores Email messages in folders. Folders allow you to organise messages, and are invaluable when you have large amounts of email. Outlook Express creates some default folders that you can use. In addition, you can create your own folders that more accurately reflect the way you work. folders which is used by all pop3 accounts. Each on of these folders is associated with a database file of the same name the database files have a .dbx extension. These folders cannot be deleted. All email sent to any POP3 account will go into the inbox folder. That means that if you have multiple POP3 email accounts configured in Outlook Express then emails sent to any of the accounts will go into the inbox. You can separate email messages using your own folders and message rules. When you add an IMAP4 Email account to outlook express a new set of folders is created for this account. 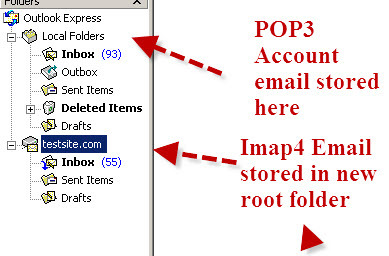 These folder have their own root folder named after the account and emails for each IMAP4 account are kept separate from the POP3 accounts, and any other IMAP accounts. IMAP was designed to leave all email on the email server. However to make the email available when the client is off-line it is possible to copy the emails to the client and vice-versa in a process called synchronisation. By default only the inbox folder will be synchronised. 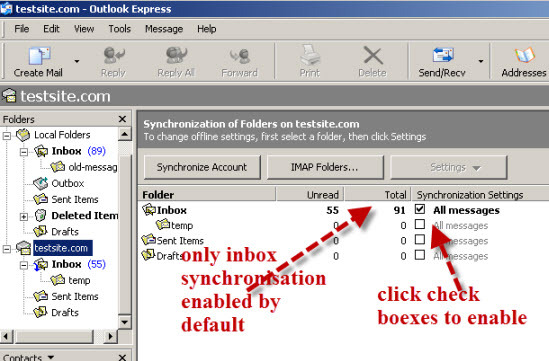 To sync other folders enable the synchronisation be checking the box. Generally all folders should be synchronised. If you have lots of email messages then the best way of organising them is to create separate folders for each type of email. You could place email from your mom in one folder and from you son in another folder etc. You can even configure message rules to move email automatically into the folder. New folders can be created under any of the default folders with the exception of the deleted items folder. I personally prefer to create all my folders underneath the inbox folder. 1. Right click the folder where you want to create you new folder and choose new folder. 2. Give the folder a name and click ok. Even though you have created additional folders to organise your email you still find that you have a lot of messages in the folder. Show All Messages.This view shows all the messages in one of your folders, such as your Inbox—new and old, read and unread. This is the default view for each folder. Hide Read Messages.This view hides all the messages you’ve read, leaving only the messages you have not read. Hide Read or Ignored Messages.This view hides messages that you have read or that you have applied the Ignore Conversation command to. Although these default views are rather basic it is possible to create your own custom views in much the same way as you create message rules. Selecting the messages you want to move then. Use CTRL and Shift keys to select multiple Messages. You should note that the destination folder can be associated with another account. In the screen shot above I could move the messages from the POP3 inbox to the IMAP4 inbox. TIP!- You can move or copy all messages from a folder by clicking on any message in the folder and entering ctrl+A which will highlight all messages in the folder. This can be used for moving all messages from one email account to a new one. Another way of managing messages in a folder is to sort the messages by their message properties. This allows you to display the messages by the date received, message sender etc. If you want to change the way your messages appear in a folder you can sort them by their properties (e.g. when received). The available properties are those which you see in the message columns. If you change the visible columns you also change what properties that are available to sort by. As an example, if the attachment column is not visible then it is not available to sort by. 1. 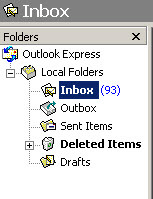 Screen shot 1 shows the inbox and its’ messages notice that only three columns are displayed. The columns for priority and attachment are missing. 2. Select view>Columns. A window shows all the available property columns and those that are currently being displayed are checked. To hide a property column uncheck the box and to view a column check the box. The order in which they are displayed can be changed by using the move up/move down button. Check the box next to attachments and priority. 3. To rearrange the order highlight the property and click the move up/move down button. The screen shot below show the attachment and priority columns moved to the top. attachments columns are now visible. We can now use these columns to sort the messages. 5. The easiest way of sorting by a particular property is to click that column header as shown in the screen shot below. You should also note that the arrow indicates the order of sorting (ascending/descending) and also which of the columns is being used for sorting. In this case we are sorting on the received column and the sort order is ascending. To reverse the order just click again. To sort by another column just click that column header. Each Outlook Express folder has a corresponding database file where the messages are actually stored. The store location can be found by going to Tools| Options| Maintenance, then click the Store Folder. Note: A quick and easy way of backing up Outlook Express messages is to copy the folder that contains the message stores. 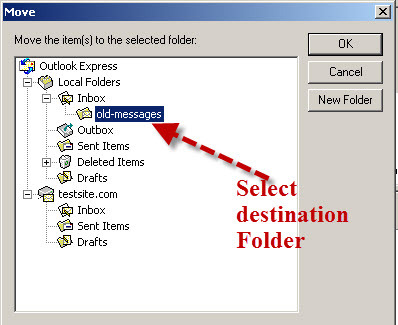 Understanding and Using Message rules on Outlook Express.